This is Covent Garden, my mother’s favourite place in London. Whenever she comes to visit she potters off, saying I’ll be at Covent Garden, come get me in a couple of hours. A couple of HOURS? One might suppose that in a couple of hours one could see a great number of street performing acts, but I put it to you that that is not so. 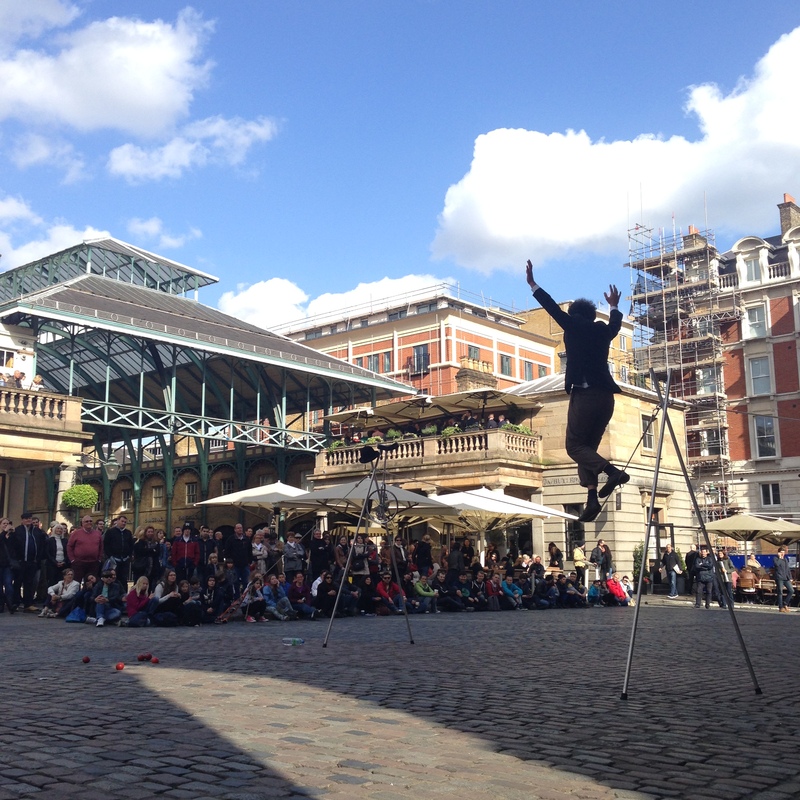 I don’t hate ALL buskers, but Covent Garden magicians and acrobats are the WORST. This guy in this picture took 24 whole minutes to get onto his make-shift wire thing. T W E N T Y F O U R M I N U T E S. I mean I get that you want to get you audience invested and all of that, but there comes a point when I’d rather pay you to hop up there in an efficient manner rather than dragging it out while my valuable shopping minutes tick by. I could easily have had a breeze around Banana and he wouldn’t have even gotten a toe on that line. Other magicians irritate me because they spend too much time on racially effective jokes. Or ineffective. Whichever you prefer. We get it: the French aren’t our favourites, the Spanish don’t get our jokes and the Germans DEFINITELY don’t get our jokes. Stop trying to tell bad jokes (which is very typically British) and get on with your stupid card trick! I say TRICK and not TRICKS because, again, they do drag it out and before you know it your ice cream is a sticky mess at your feet and the cone’s gone soggy. The worst part of it is the appeal at the end of the whole saga. Most street performers specifically ask for a fiver. A FIVER! From everyone! And they say it’s because boo hoo, they spend all day on the streets, but guess what. I’ve done that math! These blighters make BANK! And like I say, if they only knew I’d rather pay them to hustle, they could be quadrupling an already daylight-robbery-esque situation. My favourite busker isn’t even a busker, and I appreciate that. She’s a little bit crazy and she comes to the Garden a few times a week to listen to the musical buskers on the other side of the picture above. She has her own little spot there where she dances to usually two or three different conflicting busking guitars or violins or what have you all at the same time. She gets it. No faffing around, she’s just getting on with it.